William Odell Stricklin, Mrs Annette Williams' uncle, was a corporal in battery A (alpha) of the 108 Field Artillery Battalion within the 28th Division.. 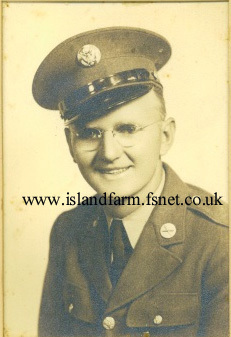 He was a radio operator who laid phone wire and also carried the radio for communication. Odell Stricklin was awarded the Silver Star for action in the battle of the Hurtgen Forest in November 1944 whilst supporting the 109 Infantry Regiment (Only the.109th and 112th were involved in the Hürtgen forest battles of November 1944). 18 October 1943: Docked at Swansea, South Wales. 19 October 1943: Arrived Penclawdd, South Wales. 13 November 1943: CO (commanding officer) left with baseball team for Gowerton to play an exhibition game for townfolks. 20 December: 1943 Island Farm Camp, Bridgend, Wales. December 1943: 3 ½ or sometimes 14 mile road marches. 22 February 1944 Bn (Battalion) arrived at Island Farm. 13 April 1944: BN arrived at Perham Downs Camp - BN left First Army and now in Third Army under General Patton. 30 Apr 44 Departed Island Farm, Bridgend, Wales. They travelled to Perham Downs, North Tidworth, Wiltshire and went on to Omaha Beach, France on 23 July 1944. Mrs Williams was generous enough to send me the text taken from the first letter her uncle wrote whilst at Island Farm. As you can tell he loved to read (the references to Scott and Hardy) and listen to music. He was also a farm boy and that is why he focuses so much on the farm information. He was quite impressed with what he saw while he was there but didn't write much about what he was actually doing as far as training was concerned! He is writing to his brother (J.R.) who he called Bud (for brother), his brother's wife Dot (Dorthea) and the "boys" who are his nephews. Odell describes the surrounding countryside and visits Merthyr Mawr and Ogmore Castle ! is awarded to Technician Fifth Grade WILLIAM O. STRICKLIN, Battery A, 108th Field Artillery Battalion, for gallantry in action against the enemy in the Hurtgen Forest, Germany on 2 and 3 November 1944. Technician Fifth Grade STRICKLIN was serving as radio operator to the Forward Observer of his artillery battery, which was supporting the 1st Battalion, 109th Infantry, in an attack on the enemy on 2 November 1944. During the attack, he and a companion laid wire from the Command Post to the forward Observation Post. After the Battalion had reached its objective, Technician Fifth Grade STRICKLIN moved his radio forward, in front of the Infantry, for better observation and successfully relayed messages to bring artillery fire on numerous defensive points and enemy mortars which were firing effectively on friendly infantry units. This he accomplished while bravely exposing himself to heavy enemy artillery fire. He remained with his radio in the proximity of the right flank of the main line of defense that night under a continuous barrage of enemy artillery and mortar fire. On the morning of 3 November 1944, the enemy counterattacked and succeeded in infiltrating the right flank of the Battalion lines. Although realizing his precarious position he stayed by his radio, regularly calling for defensive artillery fire until he lost contact. He dismantled his antenna, concealed the radio and while attempting to withdraw, was captured along with approximately 30 infantrymen. The confused Germans mistakenly led Technician Fifth Grade STRICKLIN and his captured comrades in the direction of a friendly Infantry company and when about 200 yards away the entire group was fired upon. Immediately every man took cover with the exception of Technician Fifth Grade STRICKLIN, who chanced the possibility of being hit by friendly fire and daringly ran toward the Infantry to warn them that the men fired upon were American prisoners in custody of a few armed Germans. Technician Fifth Grade STRICKLIN's actions contributed to the successful repelling of the enemy counterattack and prevented the capture of his radio, which was later used. He is also credited with averting the probable loss of the lives of his captured comrades. By his gallantry, courage and exceptional devotion to duty, Technician Fifth Grade STRICKLIN reflects great credit upon himself and the Armed Forces of the United States. Entered military service from Tennessee.